Liam Debono seen at his first arraignment following the May 15 hit-and-run, when he was 17 years old. 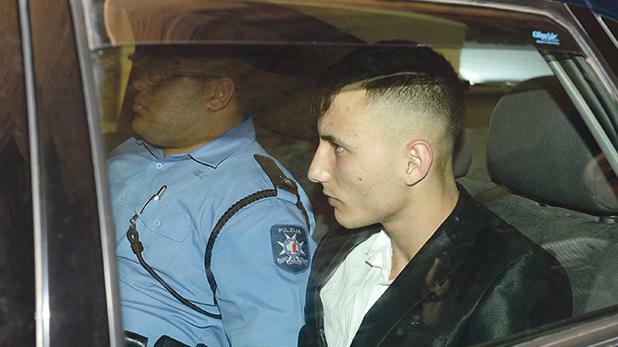 The teenage driver who mowed down traffic policeman Simon Schembri was denied bail on Tuesday, minutes after the court heard how his mother first gave him drugs when he was just nine years old, to keep him quiet. The detail was given during the compilation of evidence against Liam Debono, who stands accused of attempted murder. Schembri suffered critical injuries when he was mowed down by a Mercedes driven by Debono on May 15. A member of the Drug Squad testified how Debono himself had told the police that he had been smoking some 3 to 4 grams of cannabis daily since the age of nine. The drugs confession had followed an incident last year when a suspicious gesture by Mr Debono while at the wheel of his Mercedes in Santa Lucija had put a police patrol team on his tracks. Debono had been spotted throwing something out of the window. He later admitted that the 12 grams of cannabis grass and two crushers found in the vehicle were his, explaining further that it had been his mother who used to give him the drug to make him sleepy. During Tuesday's hearing, the court heard various testimonies which shed light on the young man’s past brushes with the law, including an incident which took place four days before that involving PC Schembri. On May 11, a couple residing at Triq is-Xintill Tarxien had heard a loud noise outside their home, before the alarm on the woman’s car had gone off. Checking outdoors, the woman’s husband had spotted a grey Mercedes going wrong way. The young driver had stepped out, telling the man “Għax ilqattaha ftit, sieħbi!” (I hit your car slightly) before being joined by his mother who lived nearby. The driver had reassured the owner of the damaged vehicle that the matter would be resolved amicably without having to call in the police. The policeman was severely injured in the May hit-and-run. Yet, four days later while watching the news, the couple realised that the teenager allegedly involved in the hit-and-run incident with the traffic policeman was the same one who had crashed into their parked car. This prompted them to file a police report. Since then, Mr Debono’s father had forked out €160 for the necessary repairs. Another officer also testified about an earlier incident wherein Mr Debono had been spotted riding an illegal electric bike allegedly while on his way to work. “One day you will thank me, my son!” the traffic policeman had told the teenager upon stopping him and ordering the confiscation of the bike. But as Debono made off on foot, he uttered offensive words at the policeman for causing him to risk his job. Orthopedic surgeon John Casaletto, on call at Mater Dei Hospital on the day of the hit-and-run, gave a graphic description of the “severe injuries” sustained by Simon Schembri, the most obvious one being his mangled right arm. The surgeon explained how the victim bore an open fracture with bones jutting out, loss of flesh, burn marks at the shoulder and rib fractures. The victim had been “in imminent danger of death” and at first sight the arm was “non-viable”, necessitating an amputation since blood vessels to the limb had been severed. As for Mr Schembri’s current condition, Mr Casaletto explained that while the patient was to have a prosthetic limb, he was still experiencing phantom limb pain which was very difficult to cure. The lengthy sitting was brought to an end with submissions on bail by defence lawyer Amadeus Cachia, who pointed out that since almost all witnesses had testified, there was no risk of tampering with evidence. Moreover, Mr Debono had firm ties in Malta and would, in the eventuality of being granted bail, take up residence with his father who followed him closely, attending every court hearing. Magistrate Joseph Mifsud halted the lawyer abruptly in his submissions, pointing out that had he not been a member of the judiciary he would have joined that protest too. The case was adjourned to October. Inspectors Fabian Fleri, PierGuido Saliba and Chantelle Casha prosecuted.